- No medical advice will be provided on this blog, nor will any interaction represent family-pet-veterinarian relationship. Emails received soliciting medical advice will not be replied to and will be deleted. If you have a medical question or are interested in discussing referral to a specialist, please contact your family veterinarian. - We have no formal financial or law training. Therefore, the information and opinions presented here are based on personal reading and are intended as general information only. They’re absolutely not a substitute for consultations with financial advisors, lawyers or any other accredited professionals. - The opinions contained in this blog are our own and should not be interpreted or taken as the views, opinions or policies of our employers or organizations we are affiliated with. - We strive to provide accurate and true content to the best of our ability. However, VetMed Survival Guide does not guarantee that omissions, technical and typographical errors, will not be present. We may make changes or update the materials provided on VetMed Survival Guide at any time without notice. - We reserve the right to delete any comments that can be viewed as inappropriate, rude, personal attacks, or spam. Comments that contain incorrect or misleading veterinary medical advice (including links to such information) will also be deleted. - Your email address and/or contact information will not be shared with any third parties without explicit permission unless required by law. - We collect information that you provide directly to us. This occurs when you subscribe to our email list, purchase a product or contact us through our website. - In order to process your payments if you purchase a product or service, a third party payment processor is used. They might collect and save the information you provided based on their privacy notices. - You may update your information at any time by contacting us at the email below. Remember that you have complete control regarding your personal data: access, correction, deletion, and to object to how we use your information. - At any time, you can unsubscribe from our mailing list and request that your information be deleted. Simply contact [email protected] and we will delete your information. Please use the same email address if you have concerns regarding this notice. - VetMed Survival Guide does not review all the websites whose links appear on its website and is not responsible for the content provided therein. Links do not imply any sort of endorsement, unless stated so. You must review and use any linked website at your own risk. 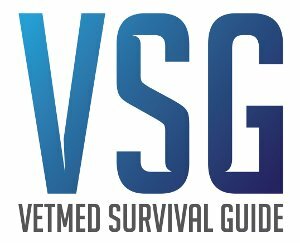 - VetMed Survival Guide is self-funded and its content is not and will not be influenced by other funding sources. Our goal is to offer you content that is helpful to you. Although certain posts might contain affiliate links, we will only promote products or services that we have used ourselves and that we feel deliver value to you. We have not received free products or services for mentioning any of these on the website. - All the content on this website is Copyright of VetMed Survival Guide and VetMedSurvivalGuide.com and may not be downloaded, reproduced, republished or otherwise copied without express written permission of the authors. Please do not hesitate to contact us if you have any questions regarding the above! Thanks!